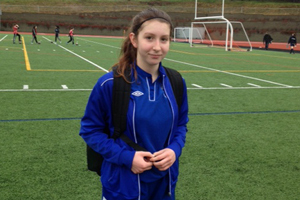 Sarah, of DCS Shock (U13 Girls Metro), scored a hat trick in the January 25th game against Burnaby Dynamite (and not her first). Her team won by a score of 3-nil, with some great goal tending and play by the entire team. Congratulations Sarah and well done girls! Previous PostU13 Girls, Champions, Richmond Winter Classic Tournament!Next PostNew U13 girls (2015/2016 team) won the Umbro Challenge Cup!